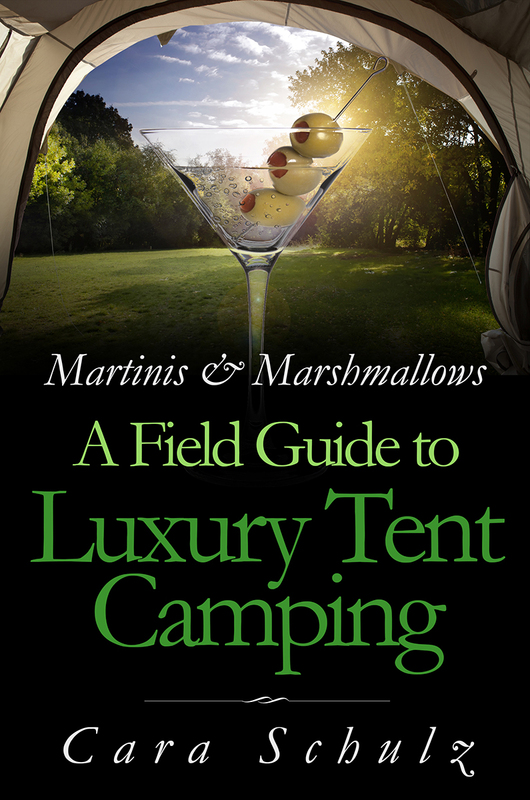 This weekend I did a quick re-shoot of a few photos for the Martinis & Marshmallows book. You can write about something all you want, but most people are visual learners and they need to see what you’re talking about. For example, take floral and greens. I usually bring plants, especially herbs, in pots when I camp. Not only is it a great way to have fresh herbs for cooking and for cocktails, it looks great! 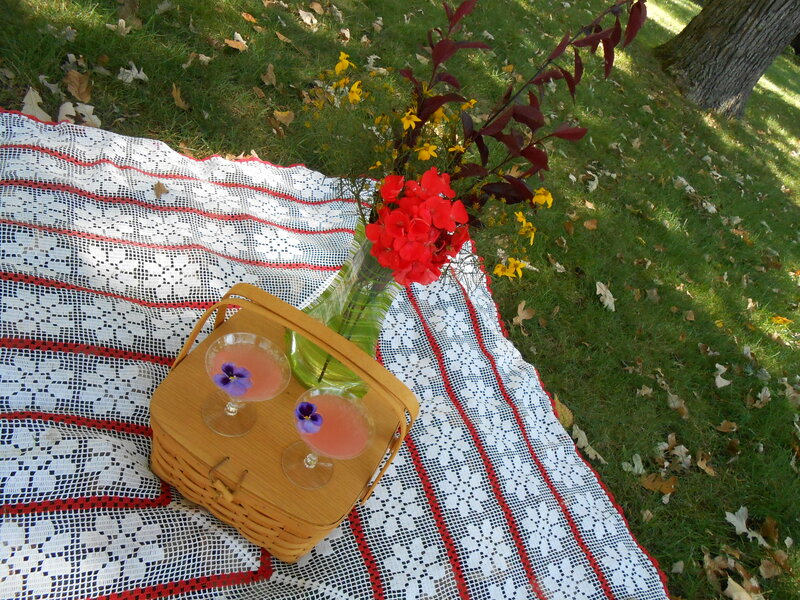 A vase of flowers can also turn your campsite or picnic from OK to stunning. Yet when I mention this or write about it, people just can’t see how that’s possible or practical. How can you bring a vase? Wouldn’t it break or take up too much space? Don’t pots of herbs tip over in the car and get dirt all over? Picnics aren’t just for picnics – they are a great (and space saving) way to take your meals while camping. No need to bring along a table and chairs, just bring a basket and a ground cloth. This picnic lunch looks many times for inviting with the addition of floral. From the edible pansies in the cocktails to the vase of flowers and fall greens behind them. Yet it all fits in the basket. The vase is a fold flat plastic bag specially designed to stand up when filled with water. When it’s not filled with water, it’s completely flat. So tuck one of these vases and a bottle of water in your basket and pick up (or pick, if you are allowed to do so in the area you’re at) a single flower or a bouquet to achieve this look. You can find these vases in many different colors, shapes, sizes, and patterns. You can find a variety of them on Amazon. If you want to take a pot of herbs camping with you, look for a wider, lower profile pot. The one I use, pictured above, can easily hold three different kinds of herbs and is almost impossible to tip over. I place it on the floor of my car and I’ve never had a problem. Fresh herbs make simple food and cocktails sublime with almost zero effort. Taking a pot of herbs on a camping trip is easier than taking fresh cut herbs in your cooler, especially for trips that last longer than 3 days. Once you cut fresh herbs and stick them in your cooler, the clock is ticking and they turn to green slime. 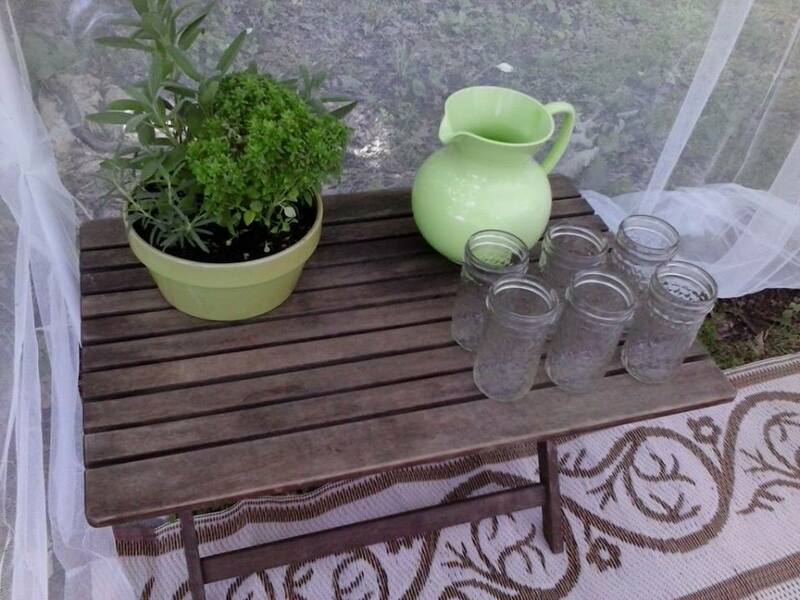 When I’m not using the pot of herbs on a camping trip, it sits on a table on my patio, looking spectacular. Do these photos change your mind about bring herbs and floral with you on your next camping trip? And as always – if you like these tips, share them with your friends.